Smallville season 6 minicaps is NOT sending Lana and Lex a wedding present. So, with Clark in the dumps because of the Lex/Lana wedding, he starts looking for more Phantom Zone escapees. That brings him to an illegal fight club involving meteor freaks and an undefeated Zoner called Titan. The bad news is Lois follows clues to the same place, and Clark has to fight Titan to save her. On the whole Lana/Lex front, Lana seems to have suffered a miscarriage. Note the words “seemed to”. We’ll get back to that complication soon enough. –Yeah, smart idea to leave Lois alone with those clues to the fight club, Clark and Chloe. Either Lois Lane looks properly dressed for being in The Matrix, or she’s going to her part-time job as Mistress Lane. I don’t have enough cash for her to inflict pain on me. –So we get another wrestling cameo this season with Kane as Titan. I think this was around the time the WWE was on the CW, so I’m sure there’s a connection. –Lex is having trouble keeping 33.1 sites up thanks to the Green Arrow crew. Who knew experimenting on meteor freaks across the globe would be so difficult? –The Man of Steel? Vixen? Doctor Maddox does have a way with nicknames. Too bad for him he gets halved by Titan. Besides Chloe finding out she may have latent meteor powers, now there’s odd gaps of memory to contend with. The memory lapses are revealed to be the work of Chloe’s institutionalized mother, Moira, who’s been snatched up by Lex for a mind control experiment. It’s revealed there’s a dark secret between Chloe and Moira that stretches back to Chloe’s childhood. Suffice to say, its another solid episode of Smallville, complete with tragic ending to boot. –Even with Chloe’s mom being rescued, she starts turning catatonic again. And even with what’s happened, Chloe can’t tell anyone else what happened or Lex will come after both Sullivans. Aw, poor Chlo. –Yep, its Lynda Carter, TV’s Wonder Woman, as Chloe’s mom. Not the first time on this show someone’s parent is played by a noteworthy actor, and not the last. –In the whole run of the show, I’m amazed there wasn’t a Lil’ Chloe, Cub Reporter episode. –Hey, you remember that unfortunate miscarriage Lana just had? Well, um, this is awkward, but it turns out she’s been pumped full of hormones and tricked into thinking she’s pregnant. Why, you may ask? You might say for Lex to seal the deal on their relationship, but there’s a far more unusual (and way too convenient in retrospect) reason we’ll get to next season. An Army bomb tech traps Lex in a booby-trapped tunnel system, wanting answers as to what Lex did to her presumed dead husband. When that line of questioning goes bad (like her blowing herself up) and Clark goes into the tunnels to save Lex, both of them need to team up to escape. Meanwhile, Lana’s not in a rush to help save Lex, but when hearing Clark’s in danger, steps up to help. Oh, and big surprise, Lex lied about not knowing what happened to the Army woman’s hubby (and look, it’s Vince Davis from season three, um, I mean Wes Keenan, although both are played by Tahmoh Penikett). Interesting episode reminding us how far the whole Clark/Lex friendship has fallen. –Those tunnel plans and designs Lex has leads to Reeves Dam. Hmmm, I think there’s a connection there. –Nice to see Lana toy with Lionel in regards to whether or not she should save him or not at the hospital. I vote “no”. –Always a smart plan to leave creepy home videos of someone else’s vacation gone wrong on your laptop. Actually, the opposite of that is what I meant. Lana gets shot while at the Daily Planet one late night, and Chloe and Jimmy are there to piece together what happened. But, Jimmy takes an unexpected detour via a blow to the head and dreams of living in a 1940’s crime noir. He’s a reporter, Lana’s a femme fatale, Lois is a singer, Lex is a rich bad guy, and Clark is…well, you should see for yourself. But this detour does lead to Chloe discovering Lana’s deal to protect Clark from Lionel, and a shady connection between Lex and a senator regarding super-soldiers. Ultimately, it’s a so-so episode with a fun interlude in the middle. –It is odd seeing Lionel in that dream sequence clean shaven with a pencil thin moustache after seeing him with a beard over six seasons. –I’m just surprised the Daily Planet is open and empty enough that Jimmy can treat Chloe to watching The Big Sleep. –Say bye to Jimmy for the rest of the season, but at least he leaves doing a version of the VJ Day kiss photo with Chloe. Aw, this almost washes out the rancid taste of that turn at the end of season eight. –Lois finds out about that bent senator, and Lionel tells her to stay clear of this matter. Unfortunately, that doesn’t happen, as can be witnessed in the next episode. 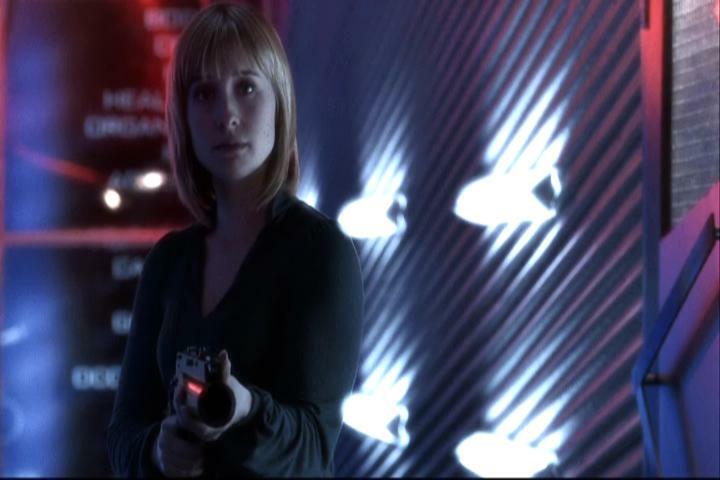 NEXT TIME: The Smallville minicaps ends for season six with a brief overview of the season, but preceding that, Lex sends a super-soldier out to kill Lois in “Prototype”, and finally, lots of twists end the season in “Phantom”. ← Nerd Adventures- San Diego on a dime!